With another killer fashion show under his belt this season and the crazy high levels of anticipation for the Balmain x H&M collection on its way, Olivier Rousteing has been opening up a lot lately to the media; he's shared stories about being bullied as a child and discussed being adopted. Most recently, he dished about Kim Kardashian, the Balmain creative director's BFF and muse, to CNN. So what does it take to be a Balmain muse, anyway? "I choose muses that are actually really different and modern," he writes in his first piece for CNN Style, which he'll be guest-editing for the month of October. "I chose them because they are contemporary, they are part of this new world." Lately, with fashion month rapping up, the H&M collection dropping, and Kardashian's second pregnancy, the two haven't been spotted together as much; Rousteing's Instagram — both his personal profile and Balmain's account — and ad campaigns seem to be dominated by Kendall Jenner, Gigi Hadid, and the rest of the Brat Pack, but Jenner's older sis Kim K is his O.G. In the CNN piece, Rousteing revealed just what it is about the infamous reality star that inspired him. 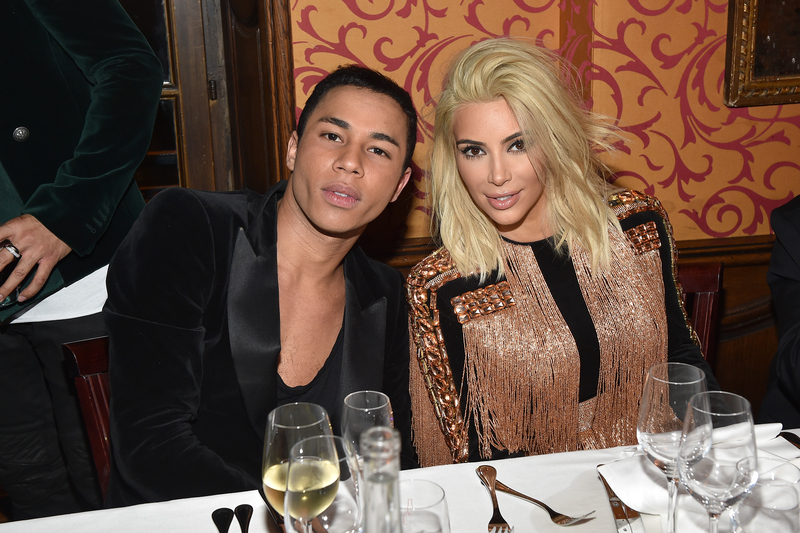 Rousteing thinks Kim K is powerful, and it's nearly impossible to disagree with that. "I also think she's pushing boundaries when it comes to the female form. I love dressing her, she's a different body type to the models on my catwalk. I love to see different body shapes, different girls, different personalities and different backgrounds — she's part of my world," he writes. "She's representing the new world and she represents the new family: Kim, Kanye, North. I think that's a modern family. When I was a child, I didn't have this example when I was growing up," he writes. In another section of the article, Rousteing describes what it was like being raised by white parents. "I was adopted from an orphanage when I was around a year old. It was 1985 in France, I was a young black child, they were a white couple — they were pushing boundaries when they chose me. I think that's a beautiful act of love." Perhaps he sees a bit of himself and even (I'm getting real Freudian here) his adoptive mother in Kardashian's beautifully diverse family. Is there anyone who embodies the Balmain brand these days better than Kim K? I think not! Want more Kim K? Check out the video below, and be sure to subscribe to Bustle’s YouTube page for more hacks and tricks!